Oakhill built home in Dillon Estates! The house sits back from the cul-de-sac on an acre lot. Attached 32 FT DEEP GARAGE! Spacious living room with vaulted ceilings and ceiling fan. There is also an efficient wood stove on a beautiful raised hearth. The kitchen opens to the living room and dining and has hand painted tiles. There is a family room that is being used as an office, and faces the front of the property. The flooring in the entry, dining, kitchen, and laundry is beautiful, durable vinyl strips that look just like wood planks. The laundry room is off the kitchen with a large window. If you don't need a work shop in the garage, the space could be another room. All 3 bedrooms are roomy and have walk in closets. 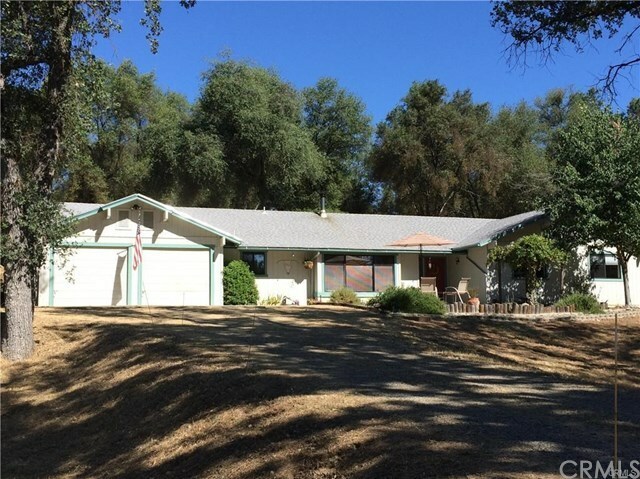 This is a very desirable area of Ahwahnee, just minutes to the center of Oakhurst. If you are looking for a quiet area with a neighborhood feel and still want privacy, this might be the perfect home for you. Call a local Realtor today to make an appointment.